Property developer, PT Metropolitan Land Tbk continues to expand and the latest one is launching Royal Venya Ubud, in Ubud Bali area. A complex of luxury villas and resorts hotels are located on the hillside. INDUSTRY.co.id - Jakarta - Property developer, PT Metropolitan Land Tbk continues to expand and the latest one is launching Royal Venya Ubud, in Ubud Bali area. A complex of luxury villas and resort hotels located on the hillside. "Bali is still a prima donna tourist destination. The increase of tourist visits both domestic and foreign. 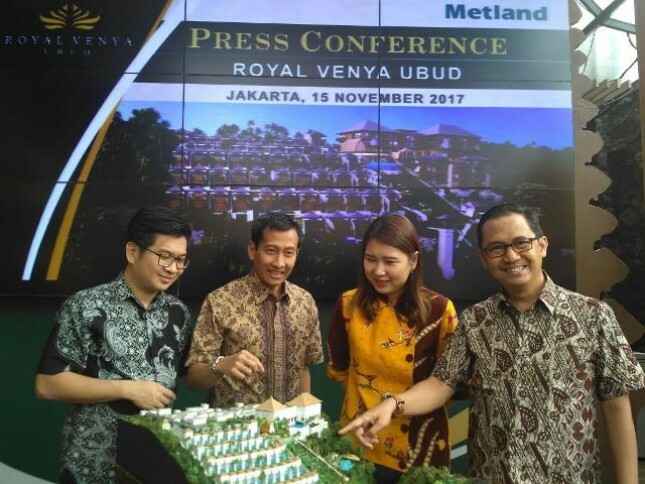 This is what prompted Metland to build Royal Venya Ubud, "said Vice President Director of PT Metropolitan Land Tbk, Anhar Sudrajat, in a press conference in Jakarta, Wednesday (15/11/2017). In the Royal Venya complex of Ubud, Metland offers a special villa unit with strata title, with a 24 percent return on investment guarantee for the first three years. This investment guarantee will be given to each unit owner at a time of 3 years. Another advantage is the buyers who will become the owner of the villa Royal Venya Ubud can also enjoy staying with the points system. "With five-star hotels, hotel rental rates range from Rp 3 million and villa rentals ranging from Rp 2.5 million to Rp 4 million," he said. It will build 54 units of villas and 40 five-star hotel rooms on a land area of ​​1.6 hectares. The villa is divided into 6 types consisting of one, two, and three bedrooms and a choice of one and two storey buildings. Building area per unit offered ranging from 60 m2 to 140 m2. Royal Venya Ubud is equipped with premium temple facilities, spa, lounge, furnicular, casade, infinity pool, wedding chapel, co working space, coffee shop terrace, reflecting pond and outbound bar.